The warming weather pattern will not only bring the warmth this week, but also the increasing chance for showers and thunderstorms. The storm threat remains over the Plains and Upper Midwest Monday night as a ridge of high pressure holds strong over northern Illinois. Thunderstorms developing over Nebraska will lift northeast into South Dakota, Iowa and Minnesota during the night but weaken as they move further into the Midwest by Tuesday morning. Temperatures in the mid 50's Tuesday morning will work to bring highs back up near 80 degrees during the afternoon. 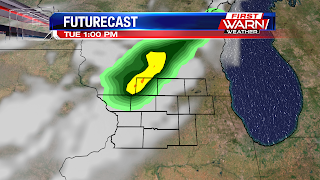 Isolated thunderstorms will be possible mid-day Tuesday with a weak wave of energy moving through the jet stream, but may be more focused up over southern Wisconsin. A better chance for thunderstorms will arrive Wednesday and Thursday with the approach of a cold front from the north. Following a few showers and isolated thunderstorms (non-severe) early Wednesday, we may end up with a decent break in activity through most of Wednesday afternoon. If Wednesday afternoon ends up mostly dry then temperatures will be up back to 80 degrees. Showers and thunderstorms will become more widespread Wednesday evening and night with the arrival of another mid-level disturbance. 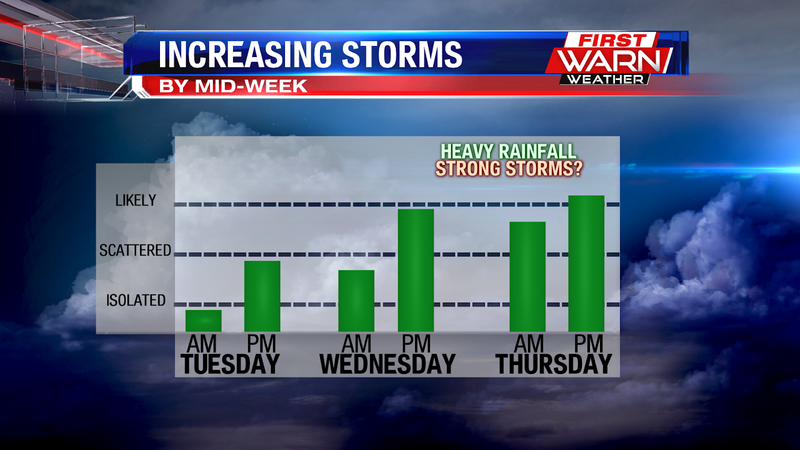 Heavy rainfall could occur through Thursday morning. The passage of a cold front Thursday keep the thunderstorm threat going into Thursday afternoon and evening. 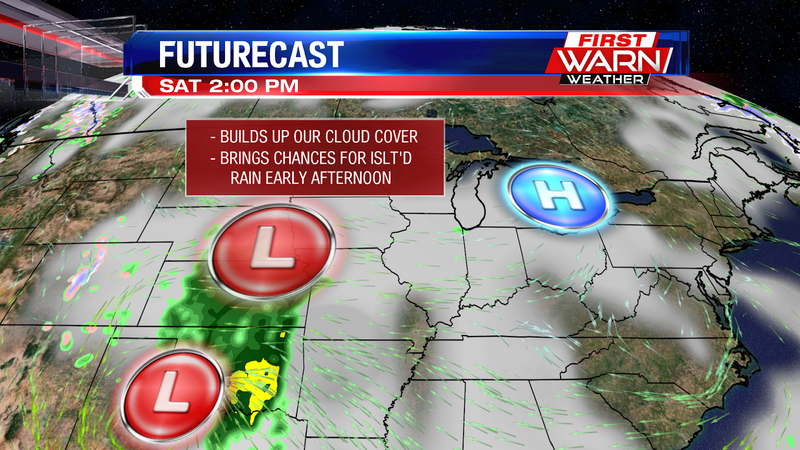 Instability will also be on the increase through Thursday as temperatures and moisture rise. Right now it appears as if the highest severe threat will remain focused to our west, but a couple stronger storms with gusty winds could be possible. 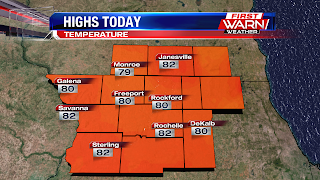 Temperatures Monday afternoon warmed into the upper 70's and low 80's area wide, officially reaching 81 degrees in Rockford. Gusty south winds helped to transport the unseasonably mild air into northern Illinois and southern Wisconsin. The strong winds will ease some Monday night but remain between 10-15 mph. This will help keep temperatures in the mid 50's during the overnight. The mild start to Tuesday will help springboard temperatures back into the upper 70's and low 80's once again. The forecast high for Tuesday is 80 degrees, but cloud cover will be on the increase during the day. An isolated storm chance will be present during the afternoon with showers and thunderstorms becoming more widespread during the overnight. Bust out the swimsuit and sunscreen, you'll need it today! High temperatures are forecast to make it to 79° this afternoon. 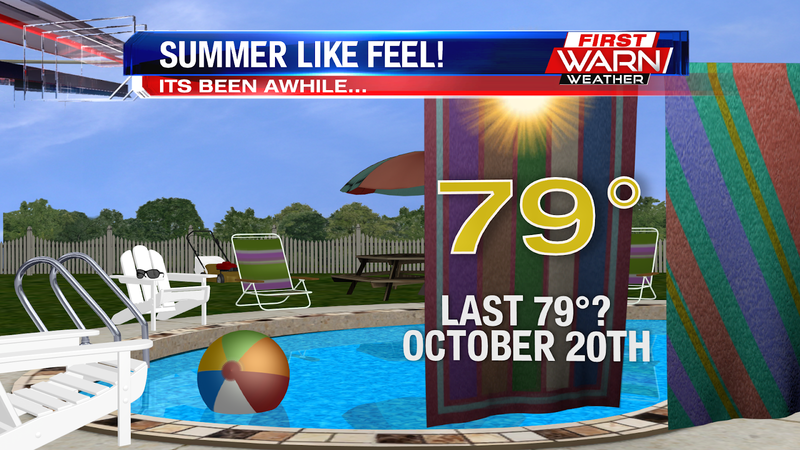 It's been awhile since temperatures have climbed that high! 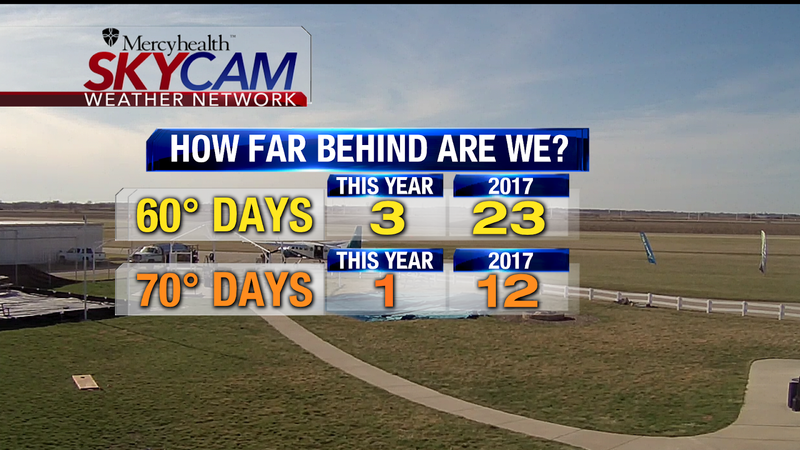 We have go back over 6 months for temperatures that warm! 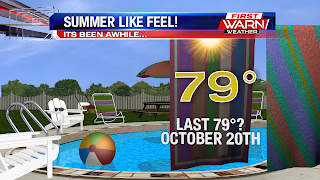 October 20th the high climbed to 79°, and we held onto 78° on the 21st. Remember to put on sunscreen if you'll be out this afternoon! I heard a few people that got burned over the weekend and high temperatures remained in the 50's and 60's! Warmth will stick around for the week, with highs likely staying in the 70's. Wednesday and Thursday also have the potential to climb into the upper 70's, but this is also when the threat for showers and storms increases. Rain and added cloud cover will likely limit how high temperatures climb Wednesday through Thursday. The cold front finally passes south of the area Friday which will bring temperatures down to around 70° through the weekend. 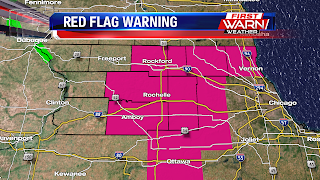 A Red Flag Warning has been issued for much of northern Illinois for Monday afternoon beginning at Noon. This means the combination of gusty winds, dry vegetation and low relative humidity will increase the fire risk during the day. 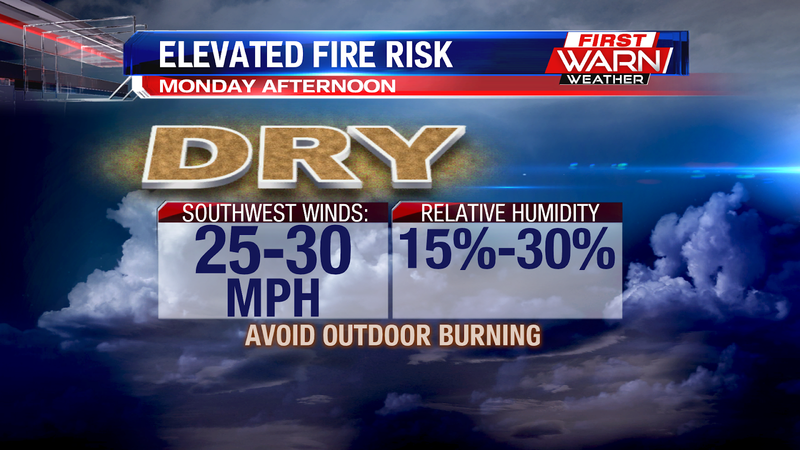 It's best to either limit, or avoid all together, any outdoor burning on Monday. Anyone else notice that their car was dirty after it rained Friday afternoon? It was almost like it rained dirt and dust. Well..it kind of did. In order for rain droplets to form, water vapor (gas in the atmosphere) must have something for it to condense on to. These 'condensation nuclei' are particles in the atmosphere, such as dust or dirt, that act as a focal point for water vapor to collect on and become water droplets - gas state into a liquid state. 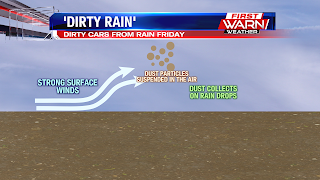 Sometimes after a light rain you may notice the rain drops left behind a little dirt, but many cars Friday afternoon became quite dirty following the light rain that fell over northern Illinois. Winds increased quite a bit Friday afternoon and early evening. 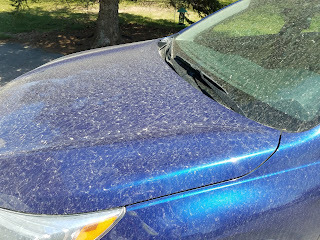 The quick increase in wind caused a lot of the dust and dirt from nearby fields, because of how dry it has been, to become suspended in the atmosphere. As the rain came down the dust particles 'collected' on the rain drops as they fell through the air. 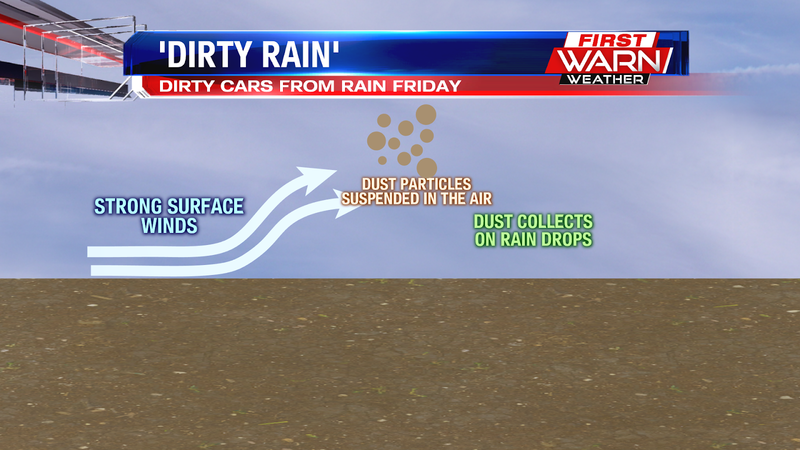 Once the rain hit ground and vehicles it evaporated, leaving behind the dirt and dust you saw on your car. There have been quite a few calls coming in over the scanners of field and grass fires Sunday afternoon. The wind hasn't been overly strong but the combination of extremely dry vegetation and very low relative humidity (under 30%), has caused fires to quickly spread out of control. The fire risk will continue Monday but could be slightly higher due to an increase in winds from the southwest as early as mid-morning Monday. Southwest winds will gust as high as 30 mph during the afternoon helping to dry out the atmosphere. 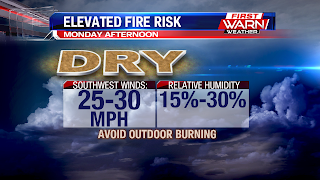 The combination of those strong winds and relative humidity under 30 percent will keep the elevated fire risk going through Monday evening. Limit or even avoid outdoor burning Monday. Dew point temperatures (more moisture) will be on the increase beginning Tuesday. So even though the wind will be increasing on Tuesday, relative humidity should be high enough to limit any fire danger. 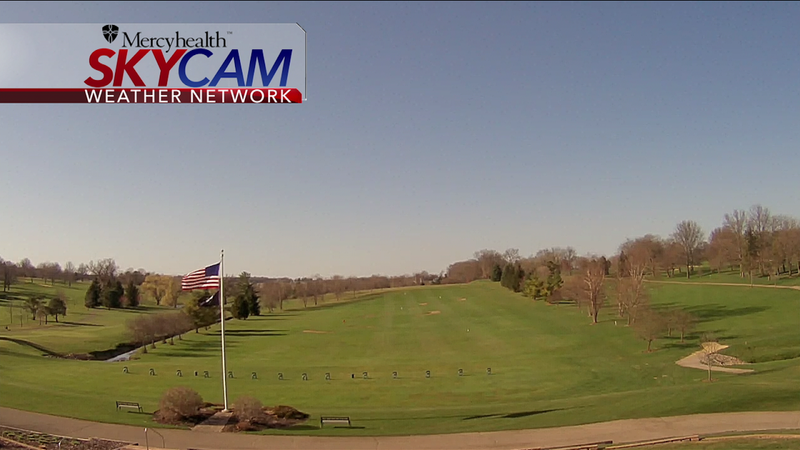 A nice view off of our Mercyhealth Skycam with those clear skies. Temperatures were cooler this afternoon, but that sunshine made everything feel fantastic! 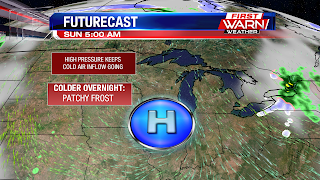 These clear skies stay with us for tonight, and this will be bringing some colder temperatures into the Stateline, which will allow for patchy frost to play a factor early Sunday morning. Our temperatures will cool off quickly going through the evening. 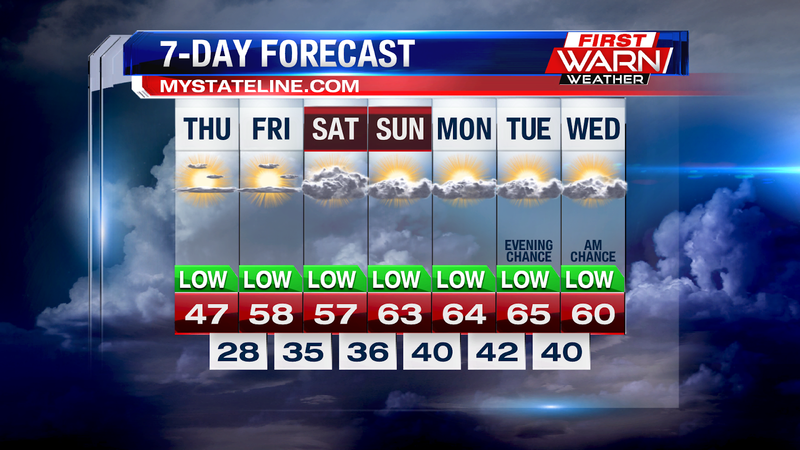 We'll start off in the low 50's, but then hit the low 40's by 9pm, before dipping into the 30's during the overnight. With the lack of cloud cover tonight and winds staying calm, our temperatures will be able to drop quite a bit overnight. Keep in mind that morning dew is more prominent in Spring, as warmer days and cooler nights allow for a better cooling opportunity. However, since we'll be below freezing by early Sunday morning, that dew will freeze and form patchy frost, so bring any plants outdoors into your home tonight. 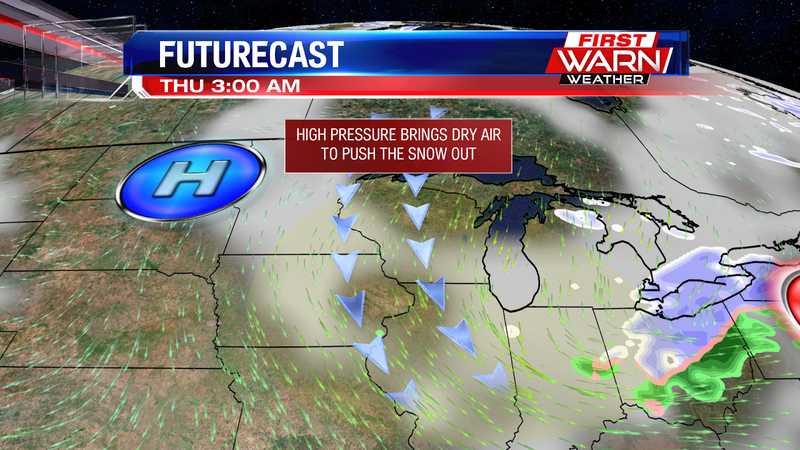 Luckily, that high pressure system will allow us to get out of those freezing temperatures quickly. We'll hit 50° by 10am, then eventually get into the mid 60's during the afternoon, all while getting to keep that beautiful sunshine. 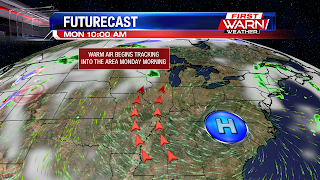 Once we get into Monday, that high pressure system will track to the southeast, and be able to pull warmer air into our area while allowing us to keep sunny conditions. 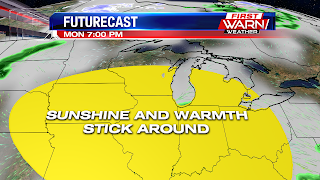 This will bring temperatures into the mid 70's Monday afternoon. 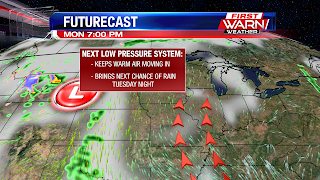 As we head into Tuesday, a low pressure system will form out in the plains, which will keep that warm air pushing through our area. However, this low will move closer Tuesday night, bringing us chances for rain, and well as chances for thunderstorms once we reach Wednesday. Thursday also brings chances for thunderstorms, but afterwards we're looking at a sunny and warm Friday, with a slight rain chance heading into Saturday. Temperatures will be in the mid to upper 70's for all of the work week next week, with chances for 80° on Tuesday and Thursday. It was nice seeing some sunshine this morning and early afternoon, but a mid-level trough moved in to bring us cloud cover and isolated showers. 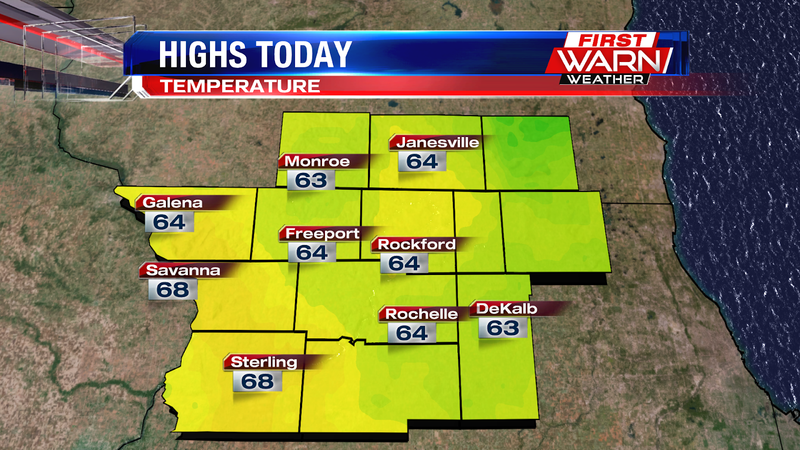 This kept temperatures in the low 60's in Rockford, while other areas got to see sunshine a little bit longer, bringing them to around 70°. Don't worry though! 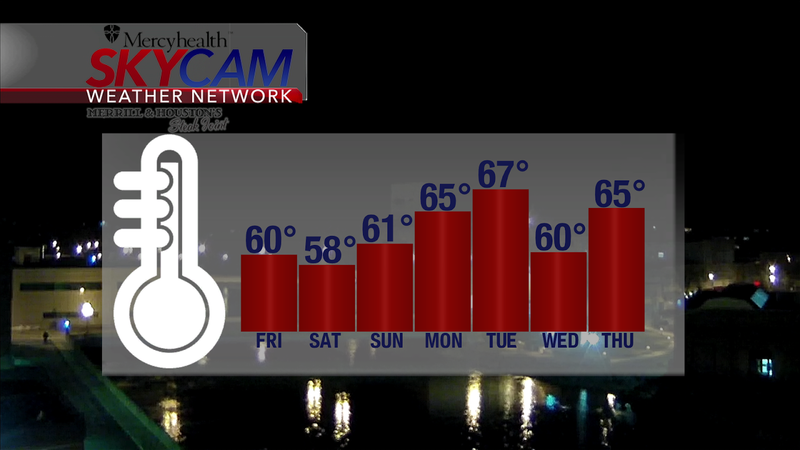 Much warmer temperatures are on the way for Rockford. 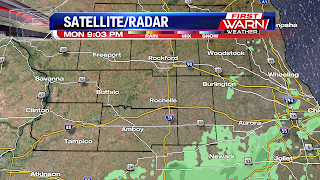 The isolated showers will stay with us through the early evening hours. 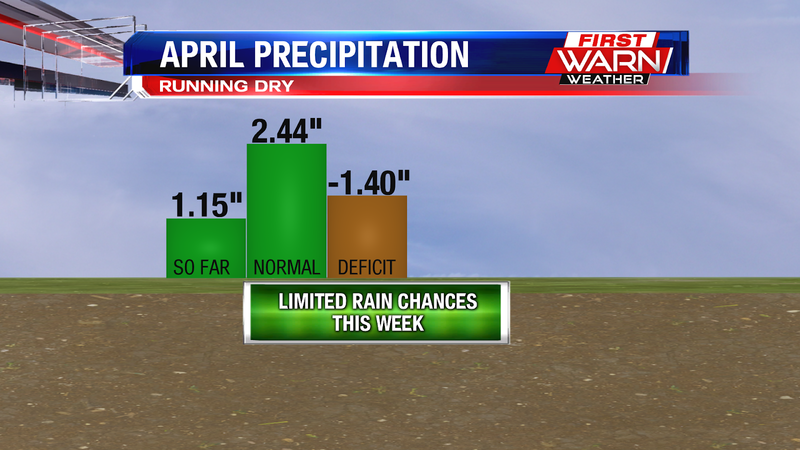 Some of these will produce heavy rain, but mostly we'll just be seeing lighter rainfall from these. 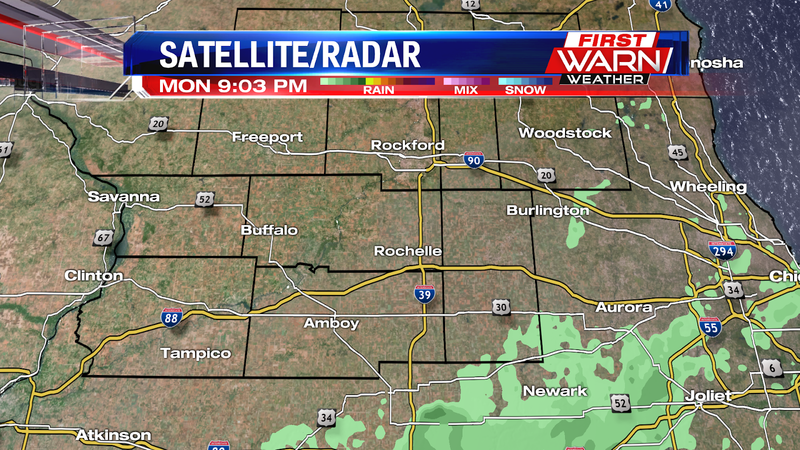 The showers will start moving out after 7pm, and afterwards we stay dry for the overnight. 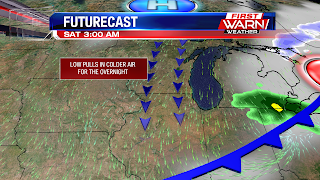 As we head into the overnight our skies will be clear, and with the combination of cool air moving in from the north and the rain-cooled air, temperatures will cool off quickly, hitting the low 40's by 10pm, and dipping into the mid 30's during the overnight. 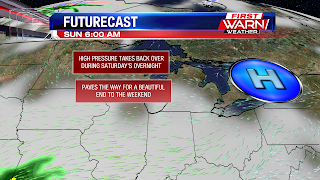 A high pressure system will track down from the north to keep the colder air moving through our area, keeping us in the mid 50's for Saturday, but we'll still get lots of sunshine. 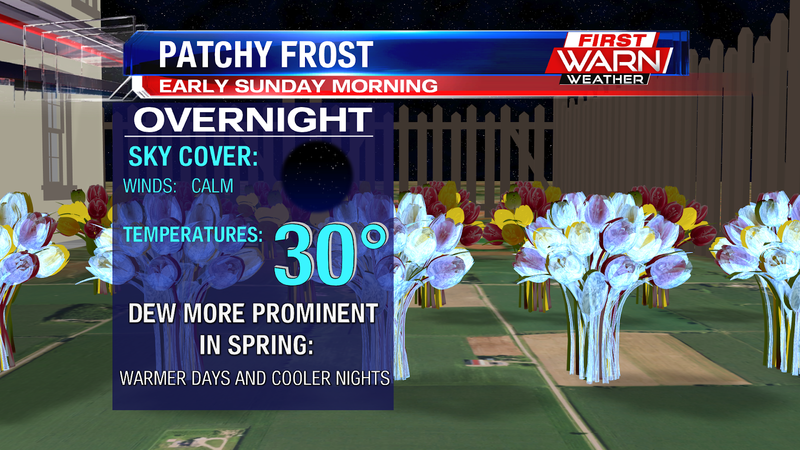 However, during the overnight Saturday night temperatures will dip below freezing in a few spots, so patchy frost will play a role, so keep that in mind if you've got plants outside. 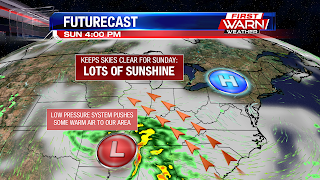 Once we reach Sunday this high pressure system will still keep our skies sunny, but it'll track slightly to the southeast, allowing for warmer air to track in, bringing us into the upper 60's for teh end of the weekend. Once we get into the work week our temperatures will warm up even more as warm air continues to push in from the south with an approaching low Monday and Tuesday. 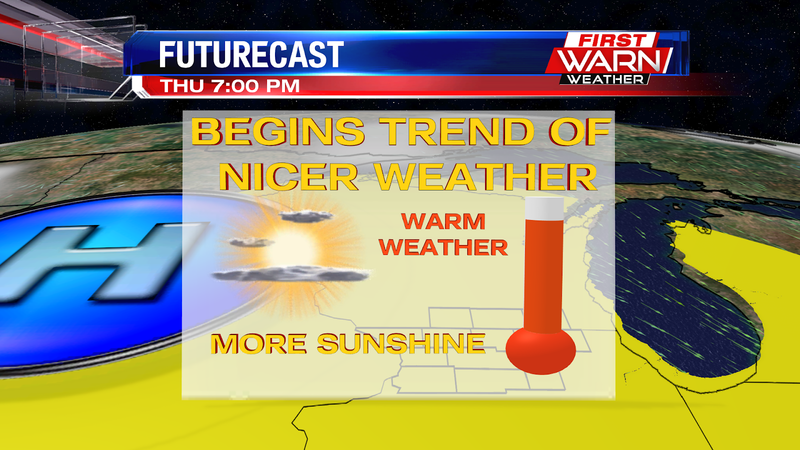 This will start a warming trend that'll allow us to be in the mid to upper 70's through all of next week. A higher fire threat exits through Iowa and for areas just east of the Mississippi River. Gusty winds, warming temperatures, and low relative humidity produce these conditions. Gusty northwest winds, at times near 30-35mph, along with low humidity around 25%, and temperatures climbing into the mid and upper 60's to near 70° will lead to a high fire danger. 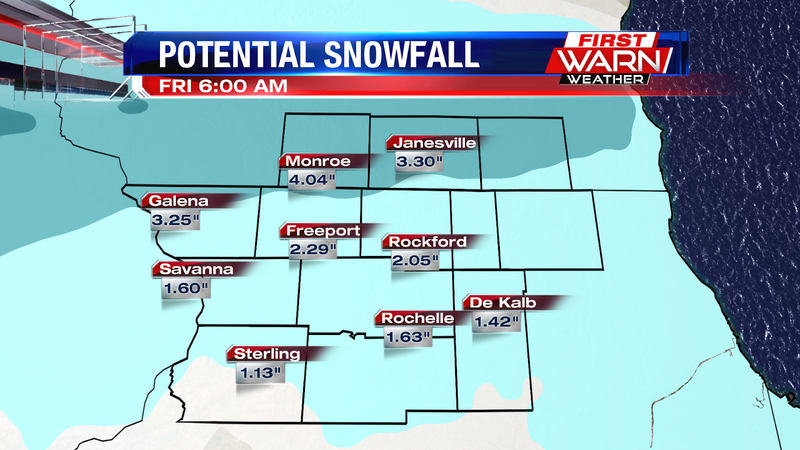 The areas to watch the most will be northwest Illinois and eastern Iowa. Time frame to think of will be late this morning through the afternoon. Winds will diminish a bit this evening with cooler temperatures. 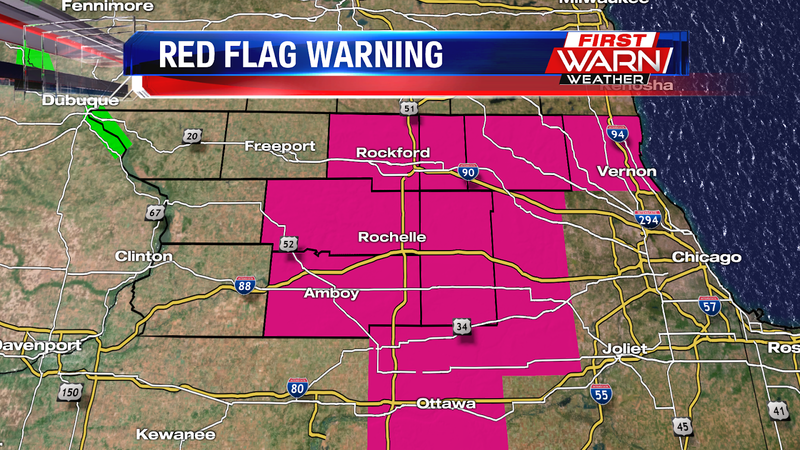 Any grass fires will spread quickly and will be difficult to control, making burning discouraged today. 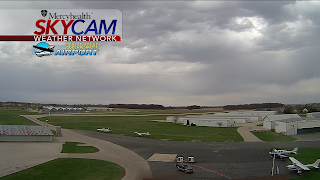 A weak cold front will pass through southern Wisconsin and northern Illinois Thursday evening bringing with it an increase in cloud cover and small chance for a passing shower. Once the front passes skies will remain mostly clear through Friday morning. Friday afternoon another cold front will move down from the north, but this one will have a little more strength to it. Skies will start clear Friday morning with cloud cover once again increasing during the early afternoon. As the cold front and low pressure system approach from the North scattered showers will develop during the afternoon and early evening. 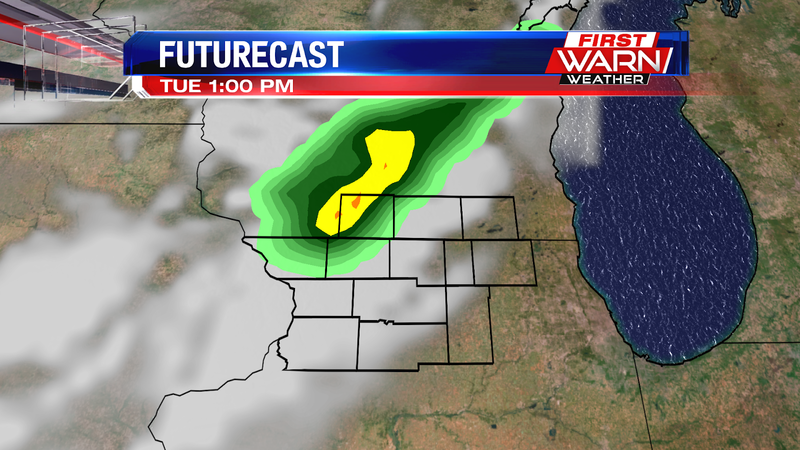 The showers will be light, but widespread throughout the Stateline mostly between 1pm and 6pm. There is even a little instability that develops during the afternoon which could prompt an isolated thunderstorm or two. The cold front and low pressure system pass after 7pm bringing drier air down from the north and keeping skies mostly clear through Saturday. Temperatures, however, will be cooler on Saturday with overnight lows falling into the mid 30's Friday night and then low 30's by Sunday morning. 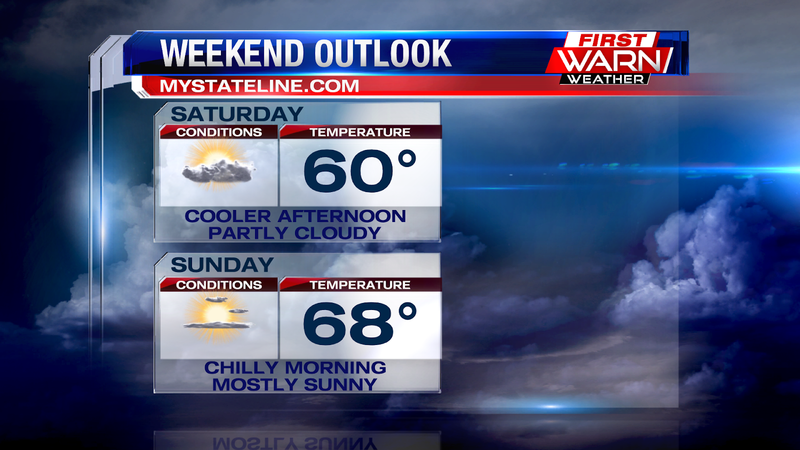 Saturday will be a cooler afternoon with highs most likely ranging from the upper 50's to low 60's. 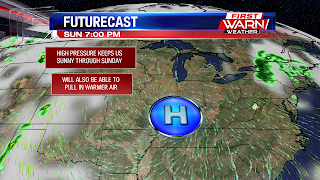 High pressure moves closer to us by Sunday which will help warm temperatures back up into the mid 60's during the afternoon. ...but we finally did it! 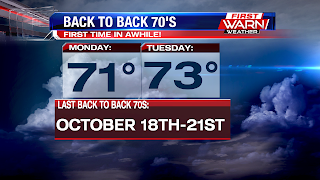 We had back to back 70's this week! Highs on Monday climbed to 71°, and yesterday the entire Stateline climbed into the low to mid 70's! 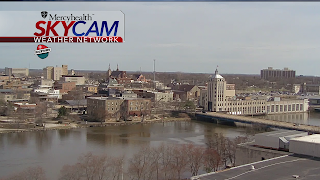 Rockford's official high was 73° yesterday. 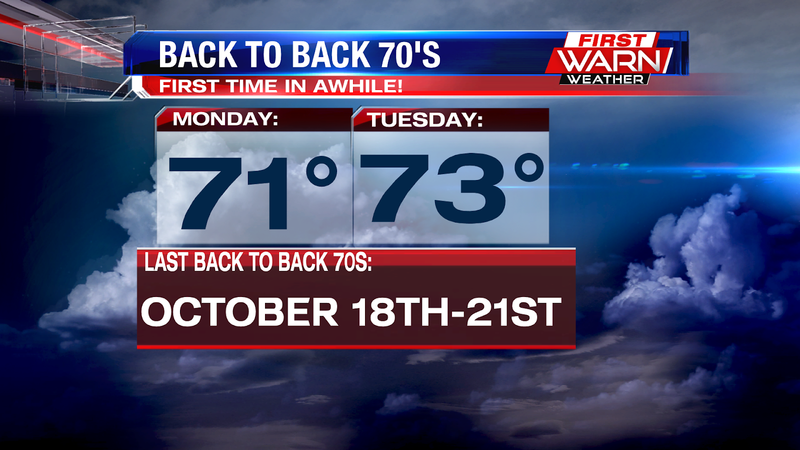 To find the last time Rockford had back to back 70's, you have to go all the way back to last October! October 18th-21st to be exact, a string of four days in the 70's. 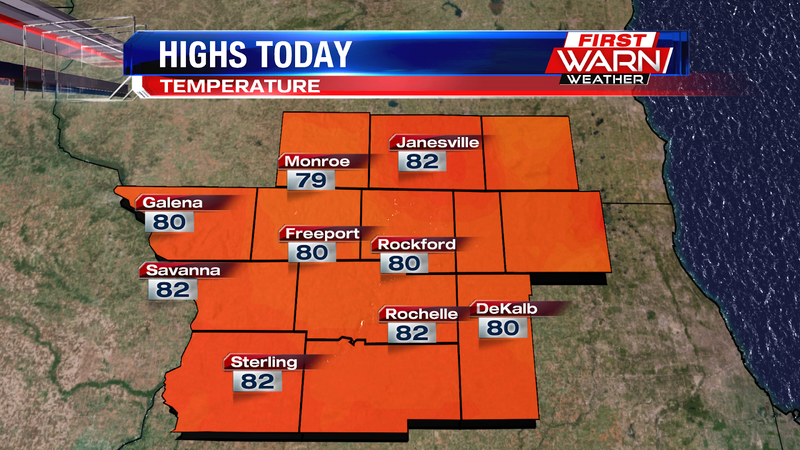 October 18th hit 72°, the high hit 71° on the 19th, then highs climbed close to 80° on the 20th and 21st. Highs on the 20th made it to 79°, and the high on the 21st made it to 78°. A cold front that passed this morning will make it a cool but comfortable afternoon with highs in the low 60's. The 60's stick around into the start of the weekend, but a change in the pattern will bring us back to the 70's by Sunday! Back to back 70 degree days sure felt nice! 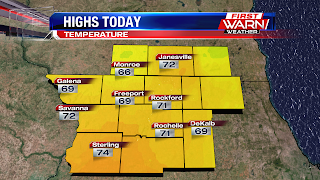 Highs on Tuesday once again warmed into the low to mid 70's, nearly ten degrees above average. An incoming cold front Tuesday evening will bring a few more clouds with it, but an overall dry forecast. In fact, it looks pretty dry heading into the weekend and early next week - when temperatures could warm close to 80 degrees. 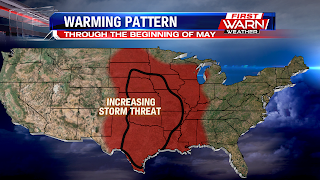 But the warmth will come with an increasing threat for showers and thunderstorms over the Plains and Midwest. High pressure will anchor itself over the Southeast by Sunday afternoon as a deepening dip (trough) in the jet stream develops over the west. The counter-clockwise spin around the Low and clockwise spin around the High will work together to bring temperatures up into the 70s and 80s over much of the middle of the country next week. As the dip in the jet stream moves east of the Rockies Monday and Tuesday an increasing chance for severe thunderstorms will be possible over the Plains and Mississippi River Valley. Thunderstorms could come close to northern Illinois and southern Wisconsin, but it all depends on the overall track of the low pressure and just how far north the warmth will extend into next week. 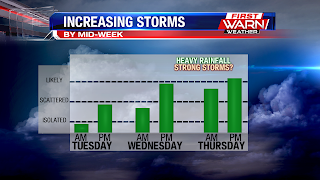 Storm chances will increase beyond Tuesday and Wednesday of next week before temperatures look to cool off once again. Temperatures this weekend finally made it to that 'average' mark, and temperatures this week will remain on either side of it. The average high is 64° and the average low is 42°. 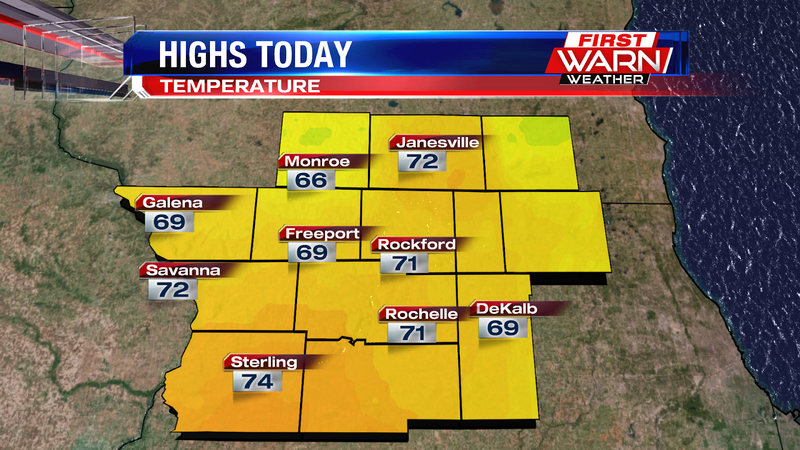 Temperatures Monday afternoon warmed into the upper 60's and low 70's, officially reaching 71 degrees in Rockford. It was the second time this month the temperature reached 70 degrees and it doesn't look like it will be the last. Cloud cover has slowly been increasing Monday evening as an area of low pressure spins through Kentucky. Light showers have been moving northwest over Indiana and Illinois Monday afternoon and could reach parts of north-central Illinois during the overnight and early Tuesday. We need the rain as precipitation has fallen below average for the month of April. We've received just a little over one inch of rain but should be up close to two and a half inches. Rain chances are limited this week, only arriving Tuesday and Thursday. Thursday will be the best chance for measurable rainfall with the arrival of a cold front late Thursday evening and Thursday night. The forecast remains dry through the weekend with temperatures warming into the mid and upper 70's by early next week. Finally! A weekend where we could get out and enjoy the outdoors without having to bundle up. 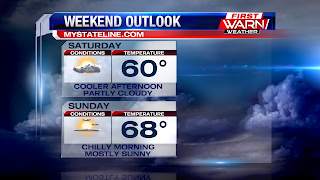 While a few showers came down on Saturday, Sunday was dry and mild with temperatures reaching the mid 60's. 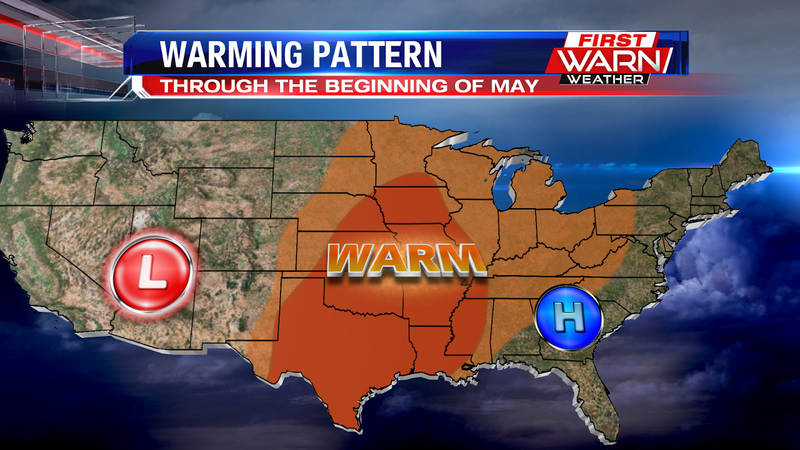 Temperatures through the last week of April will remain seasonable but there are some signals that point to the possibility of temperatures falling slightly below average once again within the first week or two of May. 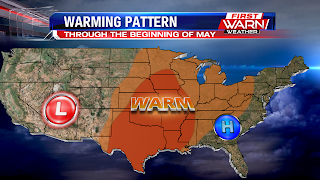 Average highs at the beginning of May should be in the upper 60's, to near 70 degrees. Even though temperatures will be warming through the end of the month, April as a whole will likely go down in the books as below average. Mostly because of just how cold it was during the first half of the month. 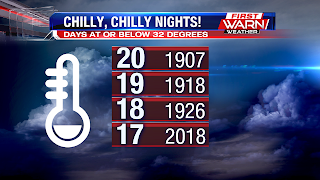 Not only were high temperatures well below average, but overnight lows were below average as well. 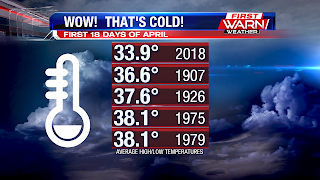 Through the first 22 days of the month, 17 of those days had overnight lows either at or below 32 degrees, putting this April as the fourth most of record for freezing temperatures. 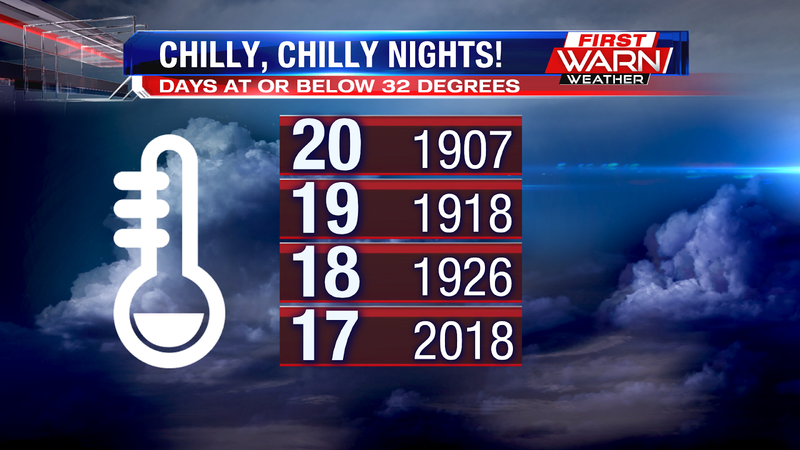 The record was 20 days set back in 1907! The fact that the third highest April was 18 days set back in 1926 just proves that the cold we were dealing with hasn't been felt in quite some time. Minus the isolated rain we had move through today, it was still nice seeing some warmer temperatures, and even getting a few peaks of sunshine early on this evening. These conditions will stay the same for early evening, with temperatures staying on the warmer side around 50°, before temperatures drop during the overnight into the mid 30's. Skies will clear up during the overnight, allowing us to wake up to some sunshine tomorrow morning, which will help warm our temperatures quickly heading through Sunday morning. We can thank this high pressure system for that, as it'll be in full control once that mid-level trough pushes southeast tonight. However, that trough will pull some warmer air into our area on Sunday, helping temperatures warm up even more. All that sunshine will bring temperatures into the mid 60's Sunday afternoon, and we keep the sunshine the entire day, so definitely make some outdoor plans for tomorrow! Once we get into the work week, that high pressure system stays in control, keeping the sunshine for Monday and allowing temperatures to warm up even more into the upper 60's, possibly hitting 70° Monday afternoon. 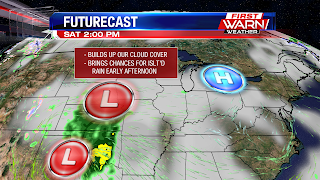 Afterwards we'll have an upper-level disturbance track into the Stateline on Tuesday, bringing chances for some showers, but we'll still be warm at around 70°. Temperatures cool off afterwards, but we'll still be on the warmer side in the 60's for Wednesday and Thursday. 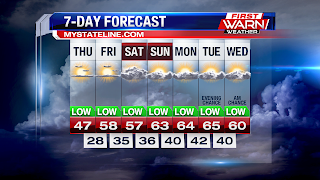 Our coldest day next week will be Friday, only hitting the mid 50's, which will still feel nice. This just gives you more reassurance that spring is here to stay! 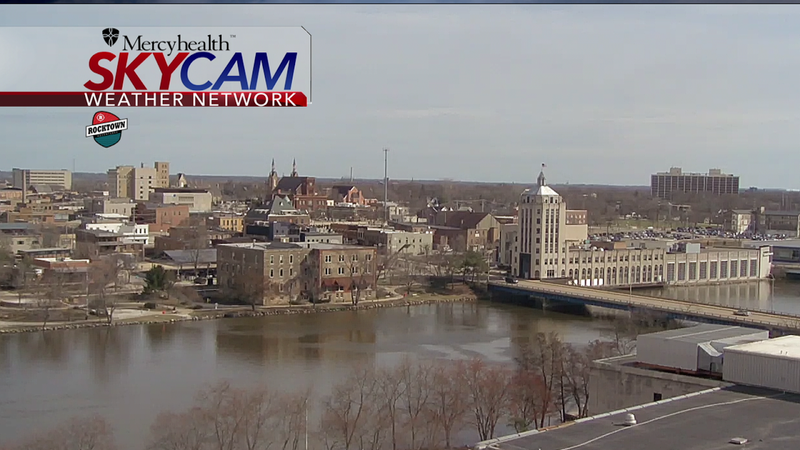 We finally got some nice weather in the Stateline, hitting 60° this afternoon and getting plenty of sunshine! A well-deserved end to the work week after dealing with winter for so long. 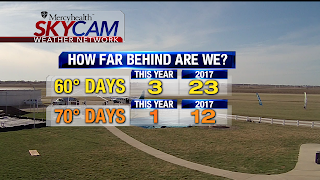 Compared to last year, we've had a pretty cold start to 2018, only seeing 3 60° days so far, and getting only one 70° day. Both being way outdone by last year's numbers. 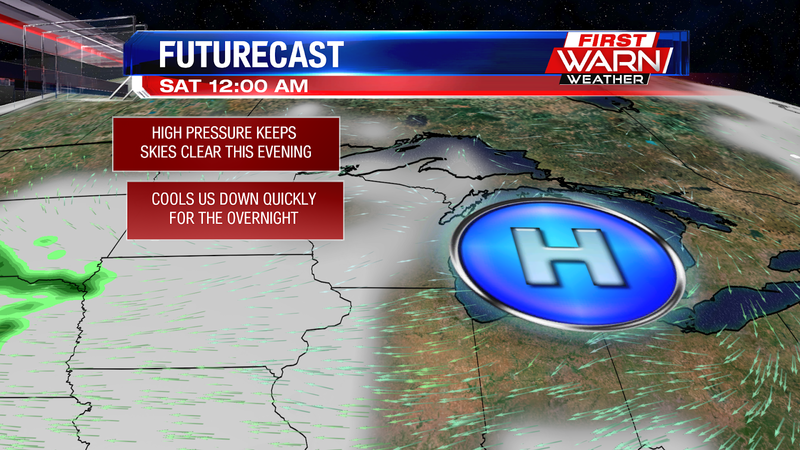 As we head into the evening this high pressure system will keep our skies clear. This will cool us down to the mid 40's by 10pm, but before 7pm we'll get to experience the 50's, so it's shaping us to be a pretty nice evening. 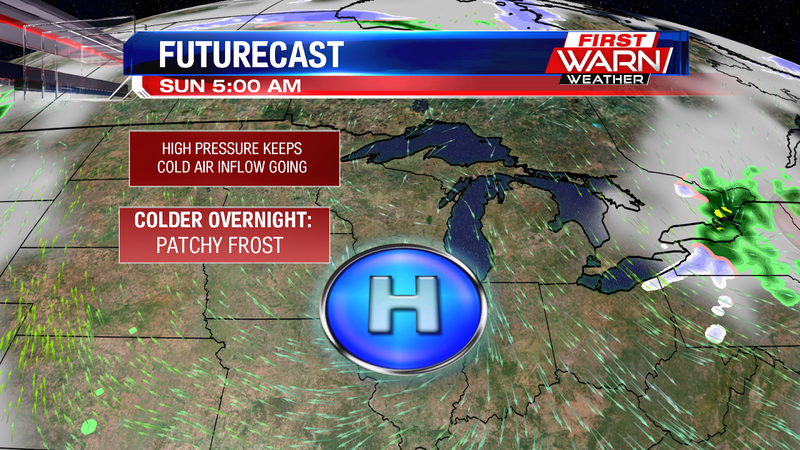 The high will continue cooling us down even after 10pm, bringing us to around 40° heading into the overnight. 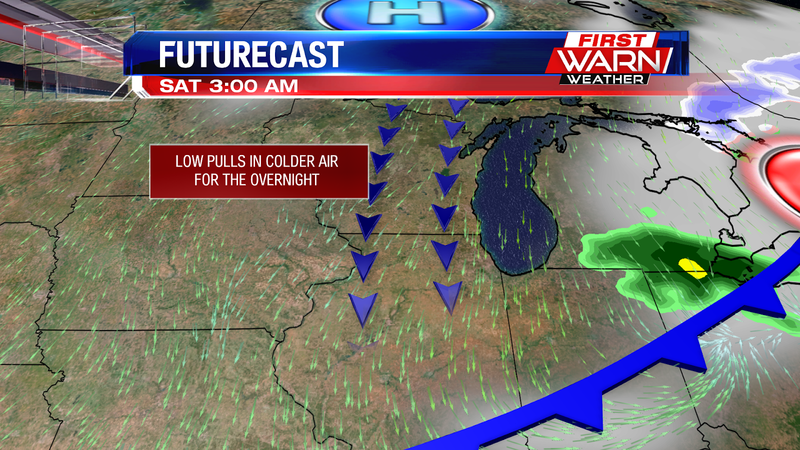 During the overnight a mid-level low will move near our area, increasing our cloud cover during the overnight. Despite the cloud cover, temperatures will still manage to cool to the mid 30's overnight, but luckily winds stay calm, so wind chill won't be a factor. The low will keep us cloudy as we head into Saturday, bringing us chances for a quick passing shower early Saturday afternoon. The low will keep us cloudy through late Saturday evening, but afterwards the high pressure system will take back over as the mid-level low moves out. The high will stay in control for the rest of the weekend afterwards, bringing us more sunshine, and allowing our temperatures to warm into the mid 60's during Sunday afternoon. This high will continue staying dominate heading into the work week, with Monday being pretty much the same as Sunday. Tuesday we'll be near 70°, before rain chances move in Tuesday night into Wednesday. Temperatures briefly cool off afterwards for the rest of the week, hitting the mid 50's on Wednesday, mid 60's on Thursday, and low 60's on Friday. However, even those temperatures will feel nice to us, considering we've been dealing with winter weather for far too long. That is not a statistic you want to hear when temperatures are supposed to be warming up. But the first 18 days of the month have been well below average. 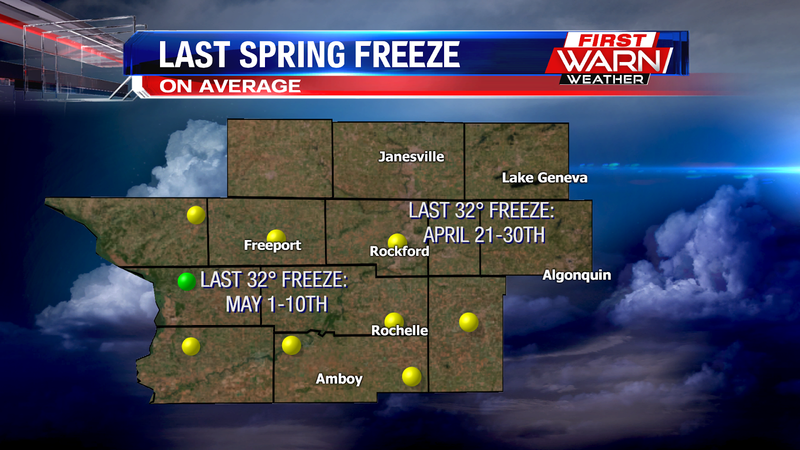 In fact, it's been the coldest first half of April on record for Rockford! 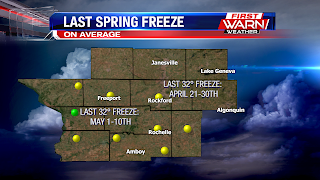 When factoring in the high and low temperatures from April 1st-18th, the average temperature was 33.9 degrees. 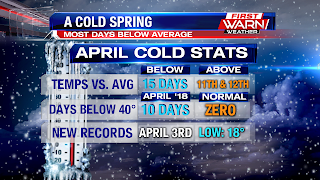 That last time it was this cold for the first half of April was back in 1907, just two years after record-keeping started in Rockford! 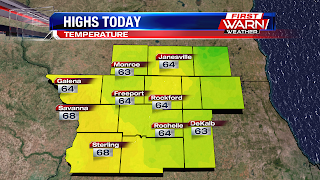 High temperatures Thursday warmed into low 50's which was a vast improvement from Wednesday afternoon. Temperatures will continue to climb into the weekend and early next week, reaching the mid 60's by next Monday. The overall pattern will change to a warmer one next week and that pattern may last through the start of May. 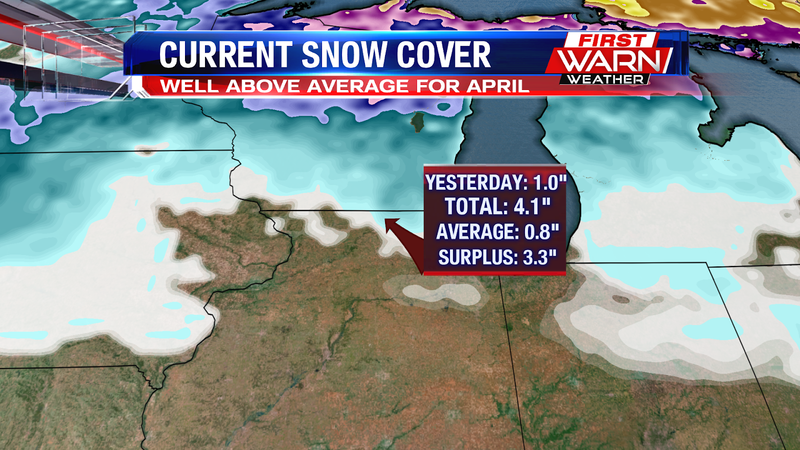 Well...no surprise here...but we've received way more snow this April then we're supposed to. 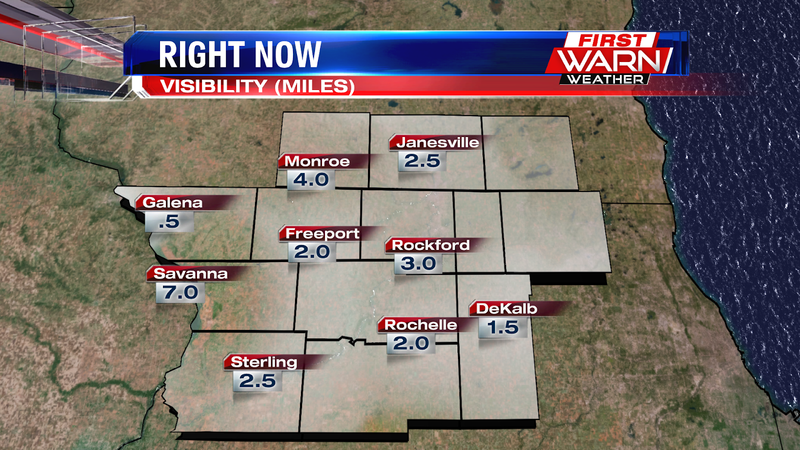 With snow falling yesterday and last night, we added another inch to Rockford's tally for snow. 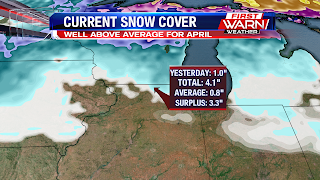 So far this month we've added up 4.1" of snow, but the average is only 0.8". That brings our monthly total to 3.3" above average! But....it could be worse. In Green Bay, 36.7" have fallen this month with a couple large systems dumping snow. The highest amount was 11" on the 14th, and they had a snow depth of 19" on the 16th. The good news is, if you aren't a fan of 'Sprinter' is that the forecast over the next seven days gets better and better. 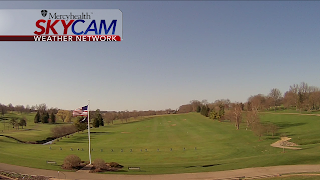 Upper 40's for highs today with mostly sunny skies, 50's Friday and Saturday, and then 60's through next week! That title just doesn't sound right in the middle of April, does it? 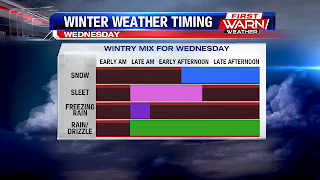 But we had quite the range of wintry weather Wednesday morning and early afternoon. From heavy sleet, rain, freezing rain, thunder, small hail and eventually snow, Mother Nature gave it all to us. But what caused the quickly changing weather over northern Illinois and southern Wisconsin? Well, it all has to do with what the temperatures were like from the bottom of the atmosphere (near the surface) to the very top. Let's think of the atmosphere as a column of air. 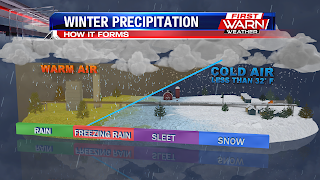 If the column of air above us is below freezing then the precipitation will fall in the form of snow. 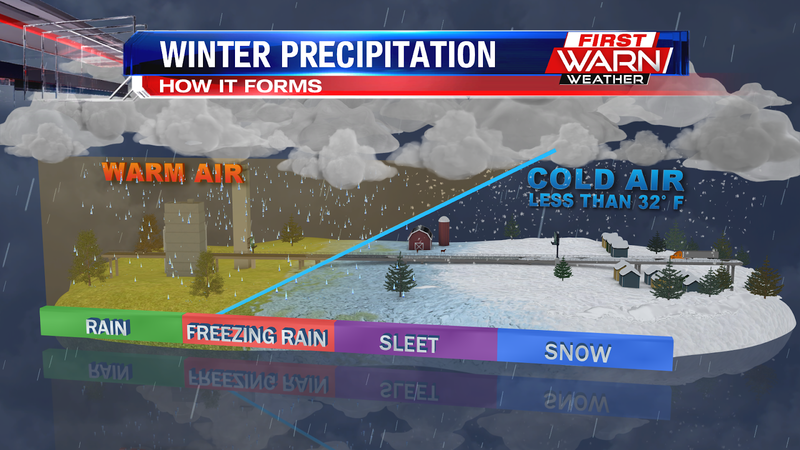 But if a 'warm layer' of air is introduced into that column, different types of precipitation will occur. Air flowing around low pressure systems flows counter-clockwise. 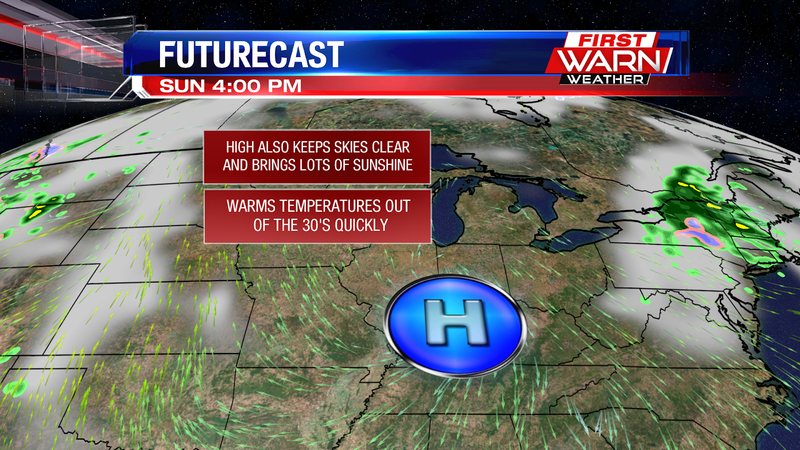 The southerly wind will bring warmer air northward, but it doesn't necessarily happen at the surface. Sometimes the warm air can ride, or move overtop, the cold air near the surface. As precipitation falls from the cloud it will initially fall as snow because temperatures at that level are below freezing. But if the snow falls into a shallow, warm layer of air above the surface the snow will partially melt within that layer. 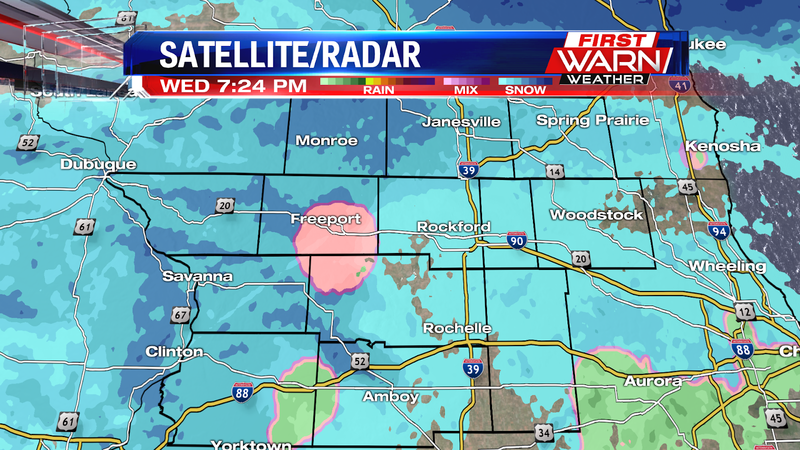 However, as it moves out of the warm layer it refreezes and will fall as sleet. If the warm layer of air is a little more deep throughout the atmosphere the snow will completely melt, becoming all liquid. During freezing rain situations rain falls through the atmosphere but will refreeze on a surface that is below 32 degrees. And for all rain to form the entire column of air is above freezing. 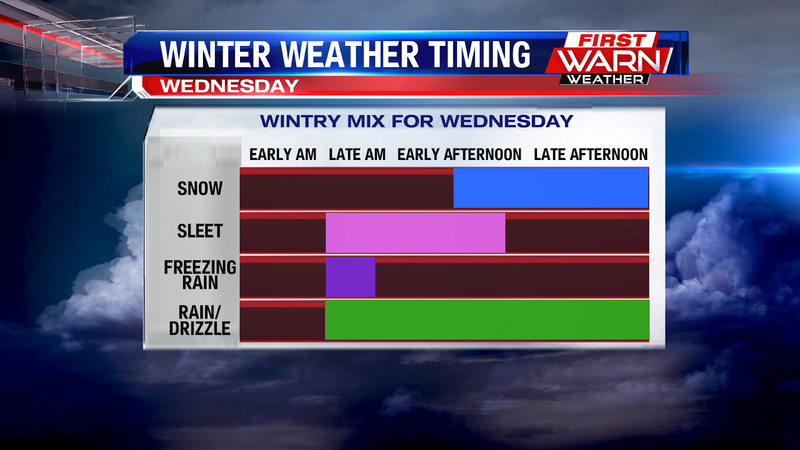 We had all four, and then some, scenarios Wednesday morning and early afternoon. But now with the passage of low pressure the transition over to light snow occurred and will continue into the overnight. 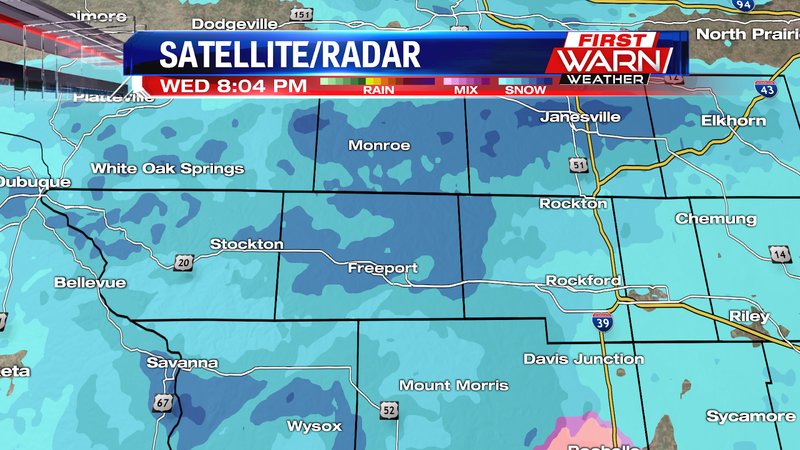 8pm Update: Light snow continues to fall Wednesday evening, with a little more steady snow from Janesville, Monroe and Freeport. 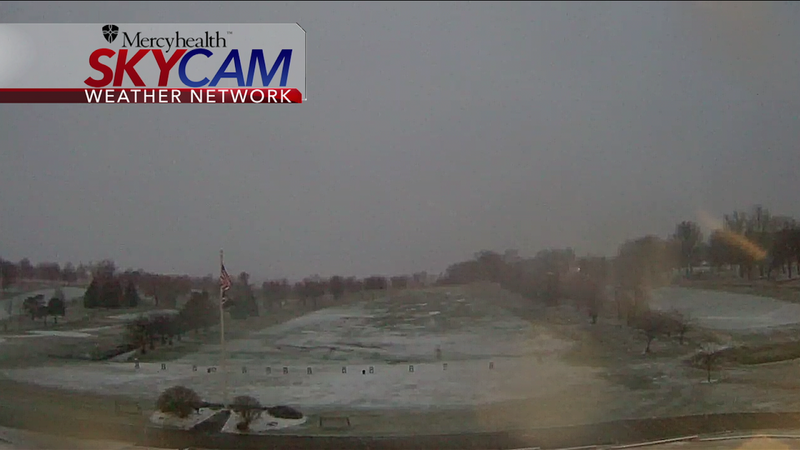 Accumulations have already started, but are mostly on grassy surfaces. 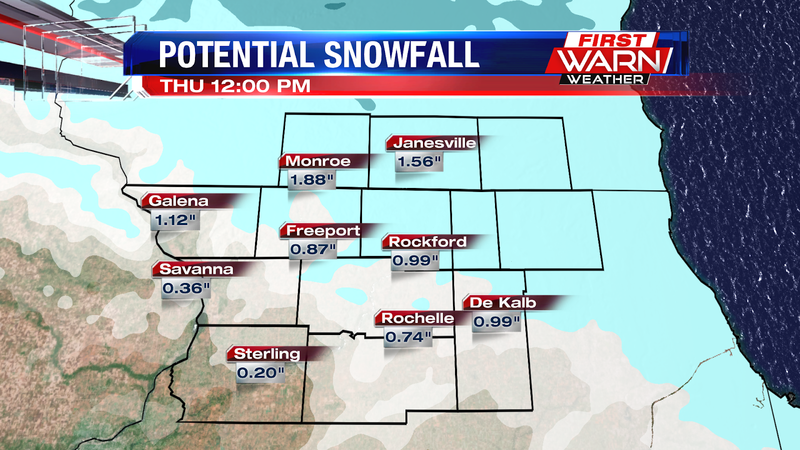 Snow totals will still range from 1" to 2" through the overnight. 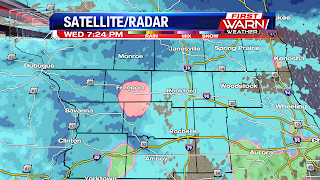 The transition over to light snow has started now that the upper level low is moving over northern Illinois. There may still be some sleet/drizzle mixing in with the snow, but I do expect a transition to all snow by 7pm this evening. Snow accumulations will remain light and mostly confined to grassy surfaces. But slush filled roads can be expected through early Thursday morning. Most of the snow will be done between Midnight and 3am Thursday morning, but cloud cover will stick around through Thursday morning. 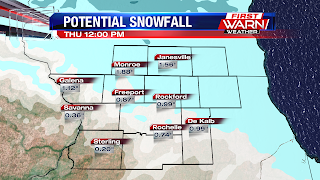 Even though the precipitation will be done before sunrise Thursday, untreated roads will still be slick. Be careful on bridges and overpasses, around curves and on/off ramps. Visibility has also been a concern this evening and has actually lowered with more moisture wrapping in around the upper level low. 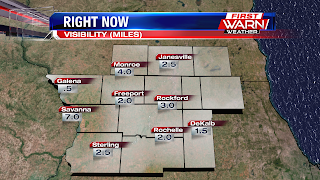 Falling snow will help to lower the visibility even further this evening and overnight. It's already down to under a mile in Galena/Dubuque. Fog may linger for some early Thursday with temperatures climbing back into the mid 40's. It's been a dry and chilly morning across northern Illinois and southern Wisconsin, as a low pressure system slows down over Iowa. We still have wintry weather in the forecast, but the timing has slowed down. 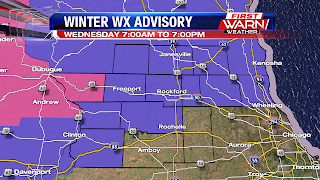 Most of northern Illinois and southern Wisconsin are included in a Winter Weather Advisory that goes into effect this morning and lasts through this evening. 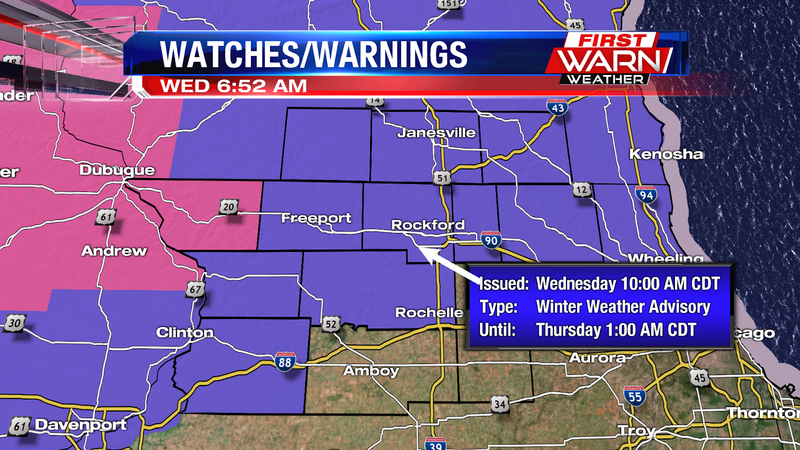 It will go into effect for the Rockford area at 10am, but goes into effect for the Freeport area around 8am. 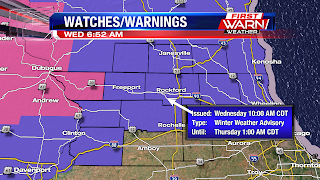 A Winter Storm Warning will go into effect for Jo Daviess county with more sleet and snow accumulations expected, especially north of 20. With the later arrival of the system, the window for freezing rain is getting smaller. This is due to warming temperatures ahead of the system, with most of the area noticing temperatures above the freezing mark. We will still have the threat for rain, sleet, thunder, and maybe even snow through the first half of the day. 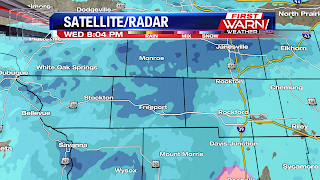 Rain will then begin to mix in with snow around 3pm this afternoon, turning to all snow around dinner time. With less freezing rain, we do have a little more snow to deal with today. 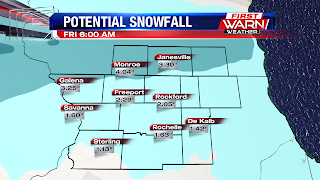 Snow totals look to climb between one to two inches for the Rockford area, but three or more are possible across southern Wisconsin and far northwest Illinois (Jo Daviess Co.). Snow will wind down around midnight tonight and sunshine returns Thursday. Spring like weather sticks around into next week! 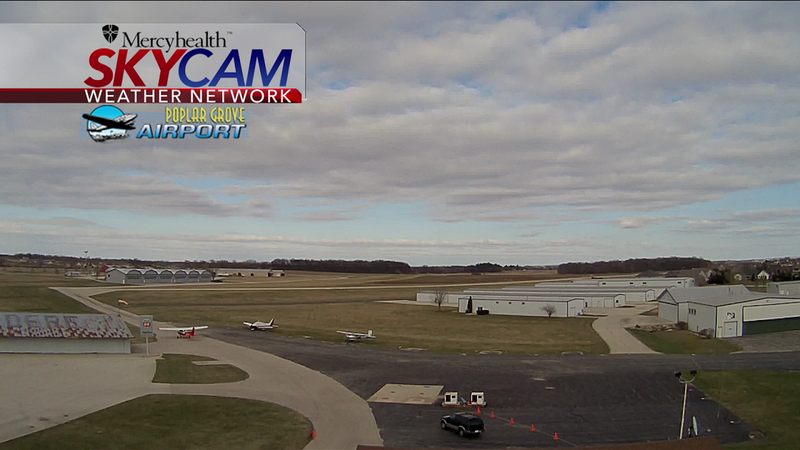 It was a much nicer day in the Stateline, finally getting to see some sunshine which helped warm us up into the 40's this afternoon. 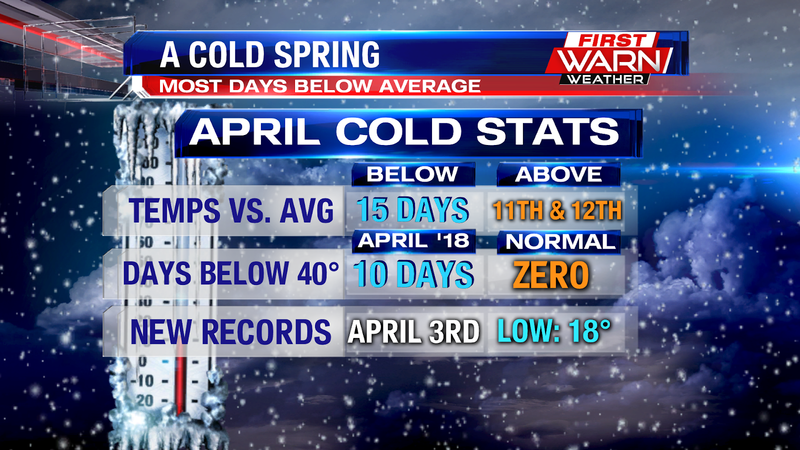 However, we're still on the cold side, having seen multiple days below average and also still having to deal with snow in the middle of April. Sadly, winter makes another presence, and another mixed bag of precipitation is on the way. 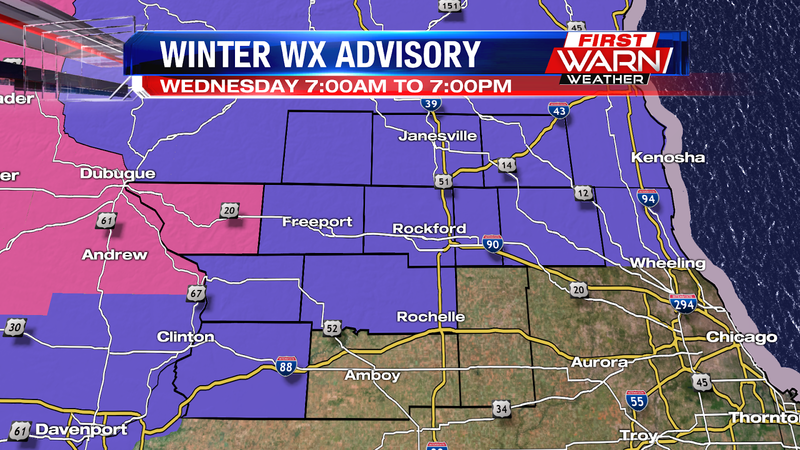 Winter Weather Advisories will go into effect starting at 7:00am Wednesday, and go until 7:00pm Wednesday evening. You'll definitely want to start considering travel conditions, as they will be poor for the entire day due to multiple forms of precipitation. As far as timing is concerned we'll start seeing this wintry mix move into the Stateline after 7am, bringing a mix of freezing rain and sleet around 10am. 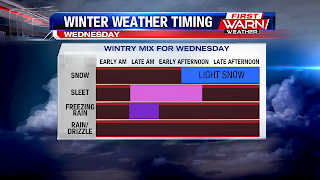 The freezing rain will die off by noon, with light snow and sleet being mixed for the early hours of the afternoon. Once we get passed 2pm, we'll start seeing snow becoming more dominate, and it'll stay that way into the evening. The good news is that accumulations will be small, with most areas seeing around 1.5 inches of snow, with 2 inches up in southern Wisconsin. 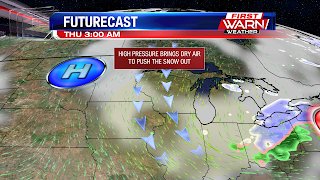 The snow will clear out after 1am Thursday, as a high pressure system will move in from the northwest to bring some drier weather to our area. This will also be a strong high pressure system, which means that we'll be expecting quite a bit of sunshine after Wednesday, and all that sunshine will gradually warm us up heading into the weekend. 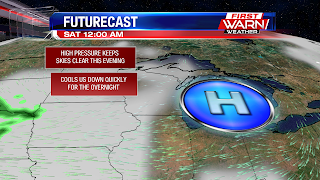 This high pressure system is expected to stick around for a while, as the pattern change in the upper levels of the atmosphere will be able to keep it strong. It'll be a little cloudy on Saturday with a small low passing by, but otherwise we're expecting sunshine and warming temperatures into early next week! It looks like winter....and feels like it too.